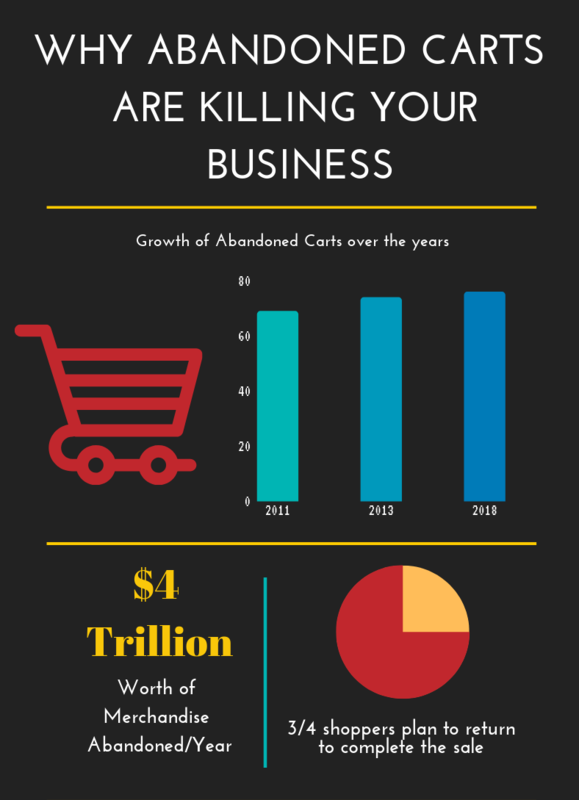 I don’t need to get into the statistics: I’m sure all you online retailers are already groaning at the mention of abandoned carts. The store seems perfect, you are running targeted FB ads, the products are incredible- and yet, they are lost to the winding passages of the web. Almosts always hurt- whether it is relationships or sales. 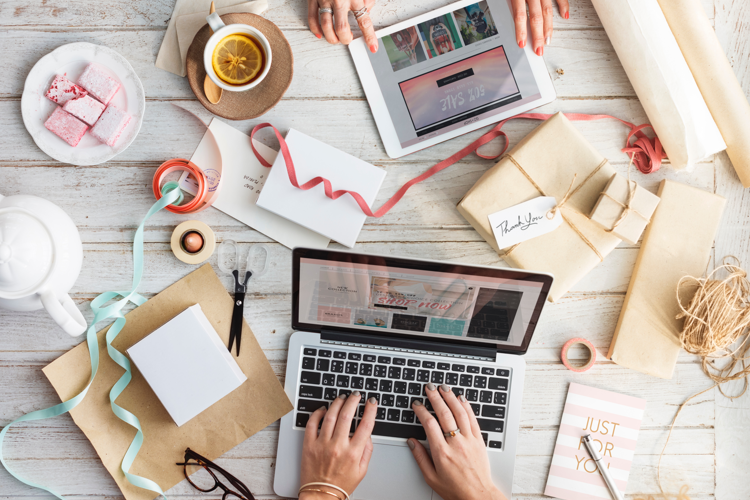 But if you do need convincing, e-commerce stores, on an average have a 75% cart abandonment rate - and you have the sole power to get them back to you. Atl east 50% of these will give you a second chance! But I am sure these statistics are nothing surprising: Ecommerce has toughened all of us. But what is surprising is that if a retailer sends a recovery email to the customer within 3 hours of cart abandonment, there is a 40% open rate. These sales are not lost. All the customers need is a little reminder, and a beckoning. 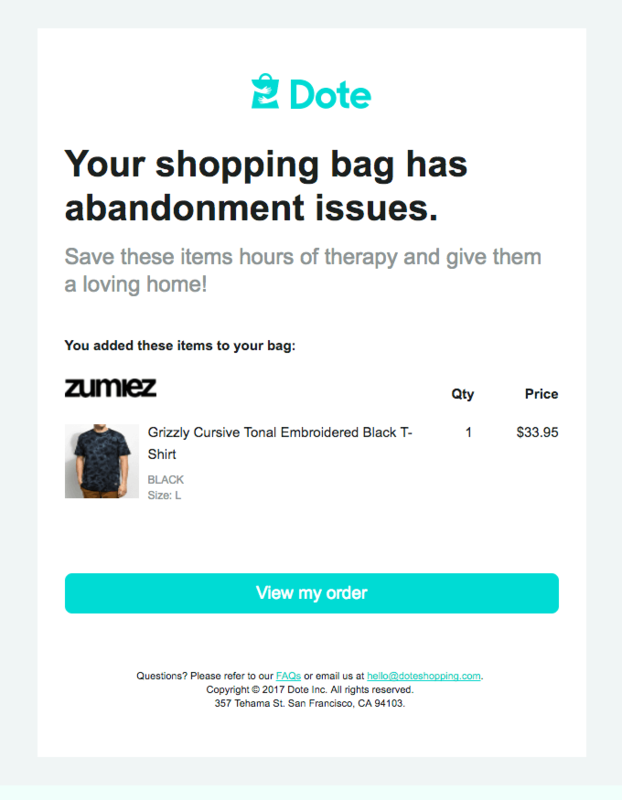 While we will cover cart abandonment in extensive detail very soon, with tips on the types of payment options you should have and the psychological boosts you can provide during the checkout process, but first, how exactly should your emails look like- and what are the right elements for an email that is supposed to reel customers back in? We voyaged over the internet to look for the most amazing emails that have proven to work, so that you can follow in their footsteps and get those precious sales back in! Not all is lost! 1. 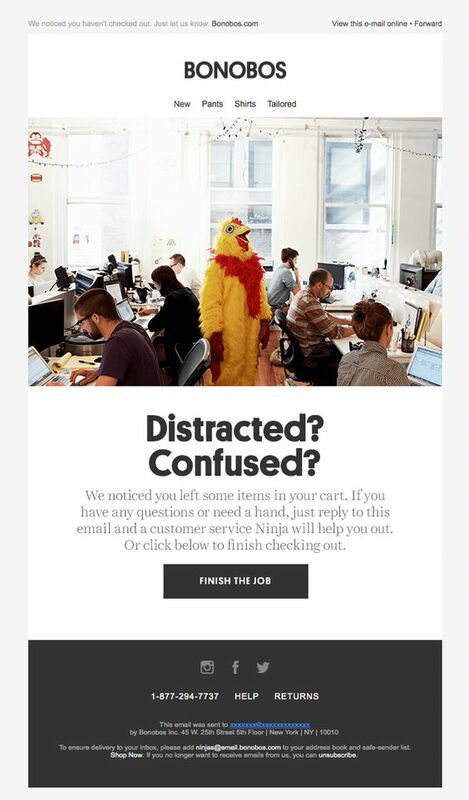 The image easily catches attention: the bright yellow of the chicken costume and the absurdity of a chicken in what seems to be an office environment catches us off guard and forces us to keep reading. 2. The ‘Finish the Job’ CTA is amusing, far more appealing than the regular ‘Shop Now’. 3. Bonobos prides itself on their exceptional customer service: and when the customer has an option to speak to a person to aid with their purchase, it definitely shows that the company cares. Customer service Ninjas get a mention in this abandonment email, which undoubtedly helps customers complete their purchases. 1. The email could be personalized a bit by using the customer’s name to establish connection. 2. The email does not include the product that customer was in the process of checking out. This is a vital piece of information that you do not want to miss out on. It is possible that your customer might not recognise your store, but they will recognise the product. 1. It is fairly to the point, with one call-to-action, directing the customer to one single action. It is clean and quick to read. 2. They aim to recover the abandoned carts by showing the customer what they are losing on by not ordering a kit: knowledge about their own self, which is a great motivator. 3. 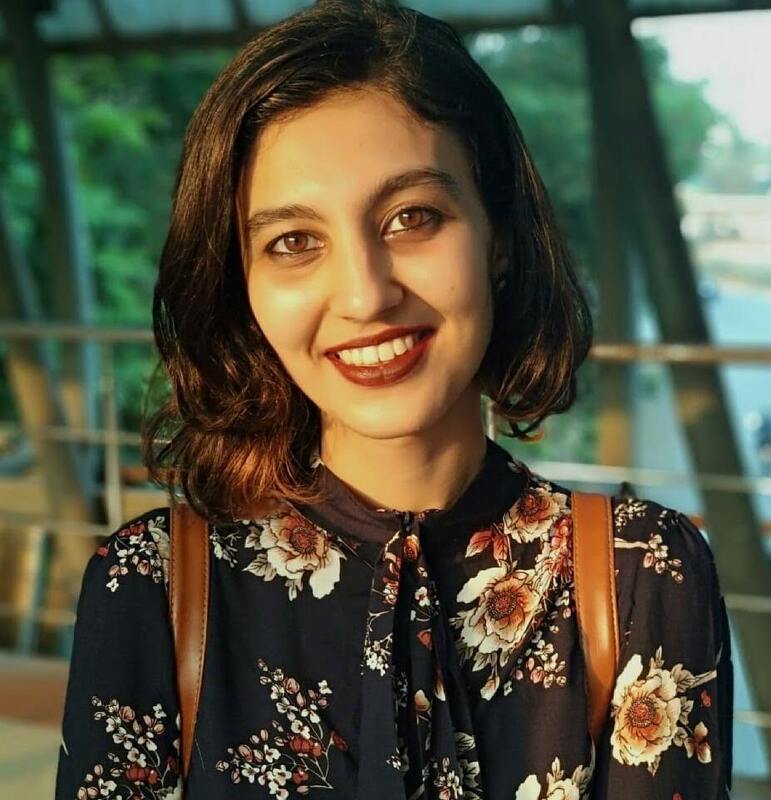 The customer care link is prominent, which is quite essential with products such as DNA kits, as people may have doubts before using it that customer support can resolve. 1. 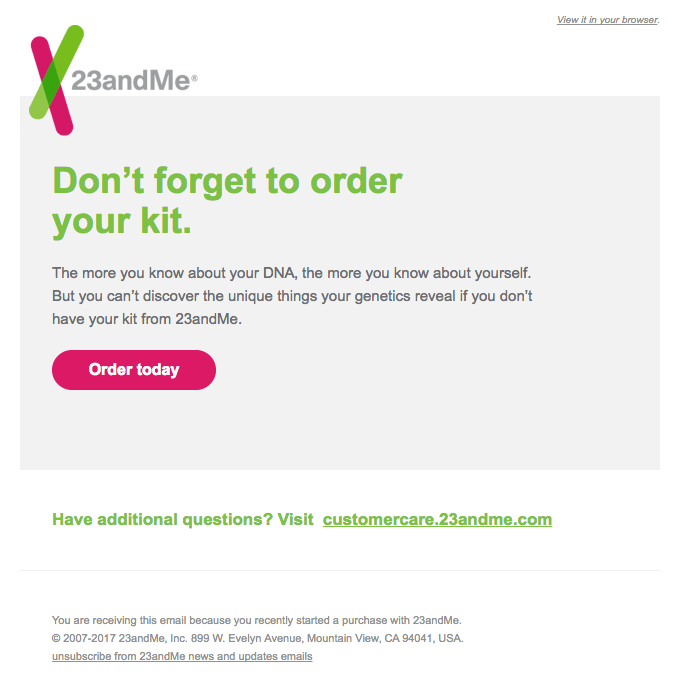 While for a product such as a DNA kit, this email works great, for ecommerce stores, conversion rates would be much higher if a picture of a person, interacting with the product was included. A brand that is built to help college students find decor and bedding items for their dorms, Dormify, chooses an informal tone with its customers. Their abandoned cart email uses language common with youngsters to build rapport. 1. The brand immediately labels itself as a friend of the customer- which is a great strategy, as the customer will feel a certain amount of guilt for not listening to their ‘friend’. The email emphasizes that the company is on your side. 2. The coupon code is a great addition- this gives an incentive to the customer to make the purchase promptly. 3. 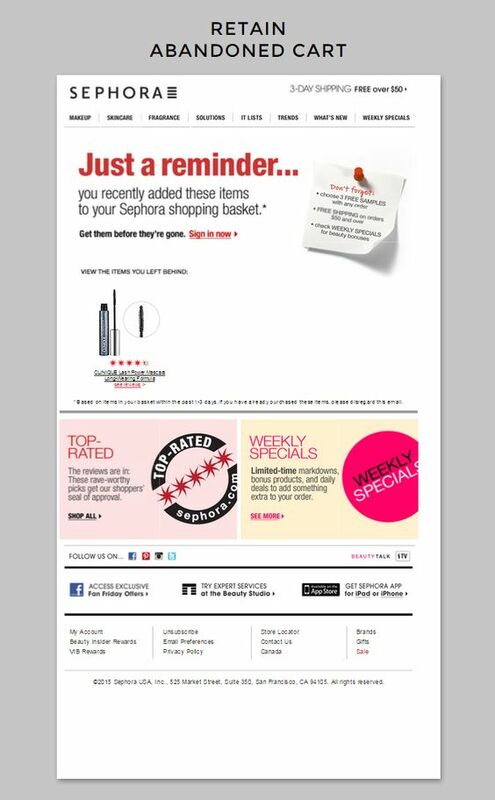 The shopping cart is right in the email, so that customers needn’t be redirected just to view their cart. 1. It is pretty on point; the only thing we would have added is the customer’s name to make the email personalized. Dote, the retail app that hosts brands such as Forever 21, Reebok and Ugg follows a very informal tone and their abandoned cart recovery campaign is similar to their website in design and voice, which is always a great strategy. 1. The use of humour in the email sets the company apart. Well-placed humour can not just convert customers but also cultivates a positive brand image. 2. A photo of the item, along with its details is a definite plus as it helps jog the customer’s memory. Any customer who abandons their cart is definitely interested in the product, so showing an image of the product is a good idea. 3. The email is clean with nothing to distract the customer from the obvious call to action. 1. If there was a certain sense of urgency in the email, we suspect customers would be more prompt with the action. 2. Similar with a discount coupon, or shipping discounts. 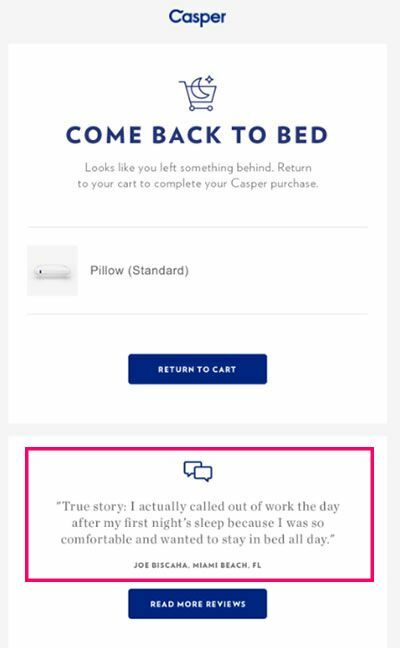 Casper, the mattress company does a great job with the abandonment emails- not only are emails sent within 24 hours, but also include social proof that aids your purchase decision. 1. The testimonial in the bottom is the most amazing thing about this email. This offers customers the assurance that others have used the product and have liked it. If a customer has added items to their cart, but changed their mind later, it might be because they weren’t sure the products would be worth the cost. A customer testimonial is exactly what would convince them otherwise. 2. The choice of words: ‘Come back to bed’ is attention-grabbing and consistent with their product. 3. Lastly, the email includes the product name and image which serves as a reminder. 1. 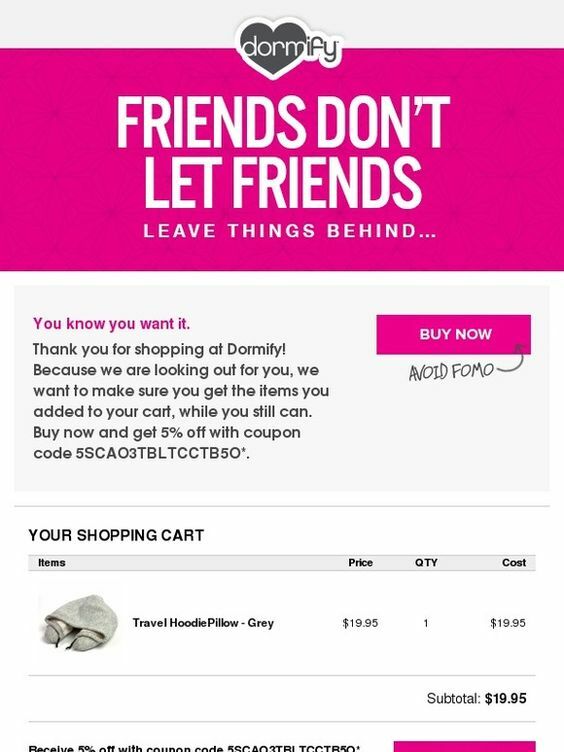 An incentive for purchase is appreciated for abandoned cart emails. 1. 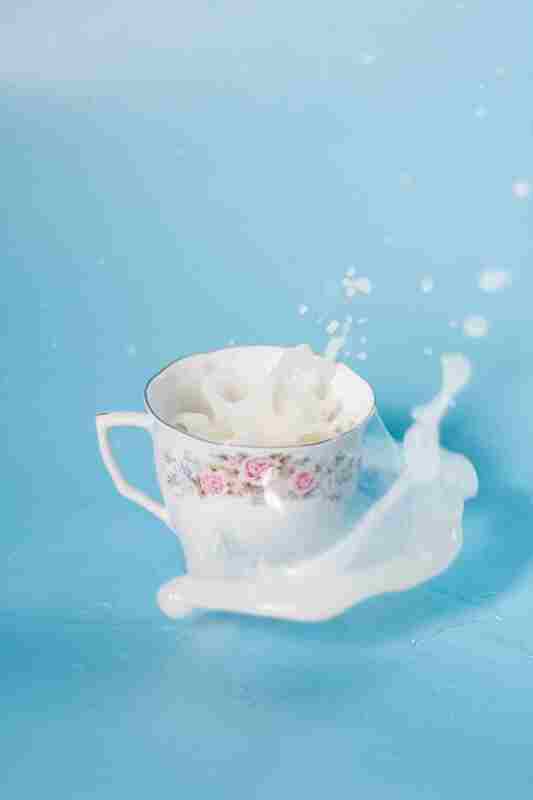 We love the images- they help the customers visualise what the products look like in human hands. 2. The checkout is entirely included in the email: this erases additional steps where the user has to click to view their cart. 3. This borders on a nay, since it diverts attention from the items abandoned, but we consider it a plus if the customer abandoned their cart because the item simply did not suit their tastes enough. The email shows items that are similar to the products chosen by the customer, which can help the customer make a switch and choose an item that they find better. 1. The social media links take up too much space: which might distract the customer from completing the sale. Once a customer lands on a social media site, it is very easy to lose them and the sale. 2. 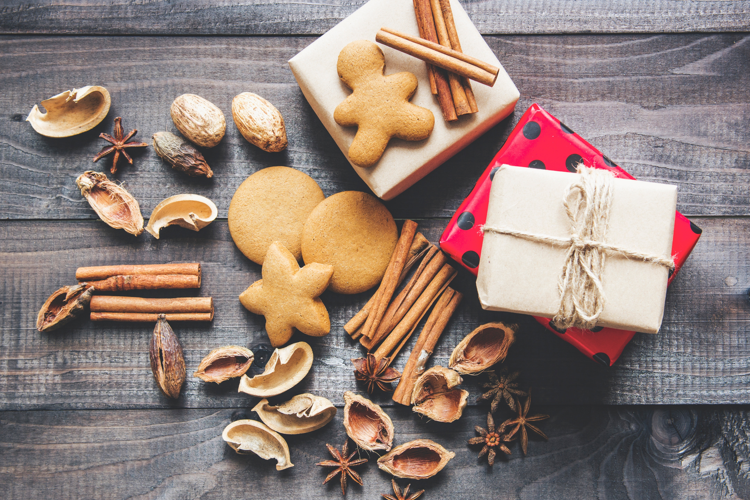 The email could be personalized a lot more: personalization is the key to winning ecommerce. 1. The two calls to action leading to the same place are an excellent addition to the email. This makes it incredibly simple for the customer to complete the purchase. 2. The email also mentions the discount is a limited offer, which spurs action. 3. ‘Reasons to shop at Dyson’ which include free 2-day delivery and 30-day money back guarantee are strong motivators for a purchase, and we definitely recommend incorporating those into your email. 1. The bottom portion is too crowded, and while that information may be important, we believe the footer should be kept to a minimum. 1. The call to action that the customer can click to go back to their cart is too small. 2. There are way too many things attacking the viewer’s attention: the weekly specials and top rated collections redirect the viewer to a different section of the Sephora site. 3. You have to sign in to go back the items in your cart. 4. Offers for alternate services in the bottom might not be the best idea, although can help to keep the user engaged with your product/service. But the worst thing you could do is not send a cart recovery email at all. Make sure to retarget your almost-customers. Acquisition of customers is expensive- they have lent you their email addresses: all you have to do is remind them why they walked up to the checkout in the first place! There are apps such as Recart that automatically send a reminder to your customers if they leave products in their shopping bag. The above templates should guide you in creating your own enticing email that convinces the Rachels of the world to go back to Ross ie. your store. You get the gist.